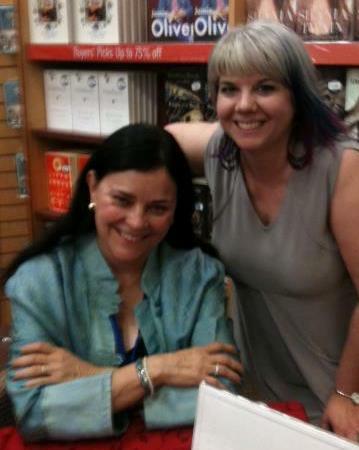 Diana Gabaldon and I at the Strawberry Hill Chapters in Surrey: a gala fund raiser for the Surrey International Writers’ Conference. This was a nice opportunity to chat a bit with her, as I visited with all of the other authors, waiting until the crowds were gone to speak to her. Since we’ve been corresponding for a few months, she knew who I was and was very welcoming. Now to get a good night’s sleep before falling off the deep end into the conference! PS. You can’t see them, but there are new Fluevogs on my feet after a pilgrimage to the Gastown Fluevog HQ… 🙂 (It’s been a very happy day celebrating my addictions). PS4. I was also amused to meet Diana’s son Sam Sykes, who wasn’t an official author at this event. He’s amusing.